Do you want a delicious salad to go with dinner? 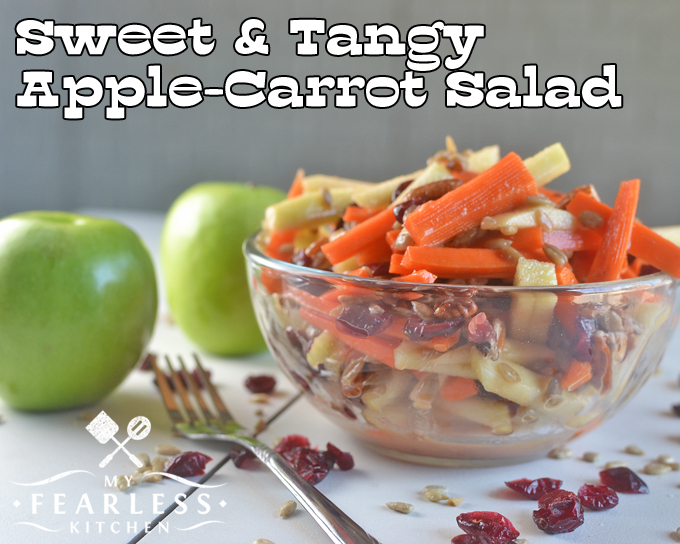 Try this Sweet & Tangy Apple-Carrot Salad instead of a regular leaf lettuce salad. Everyone will love it! I’m never sure what to make for side dishes. I love working on recipes for main dishes, but I just always forget about the sides! 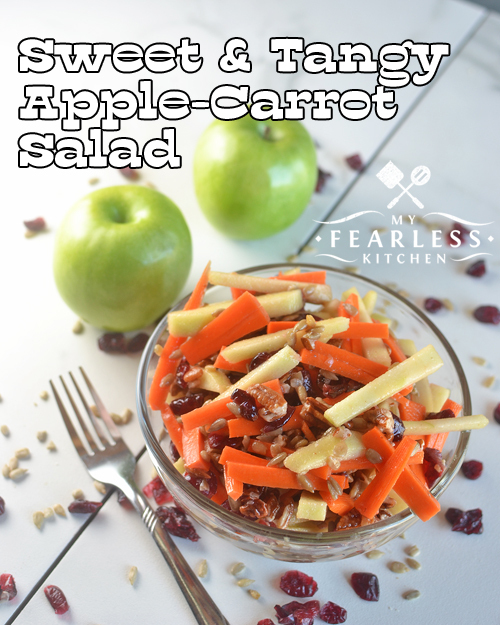 With this delicious Sweet & Tangy Apple-Carrot Salad, you’ll want to make this first, and come up with your main dish later! The original recipe for this salad is in Mom Knows Best by Gooseberry Patch. I adjusted it just a little bit. I have loved absolutely everything in this cookbook so far, and I’m sure you will, too! 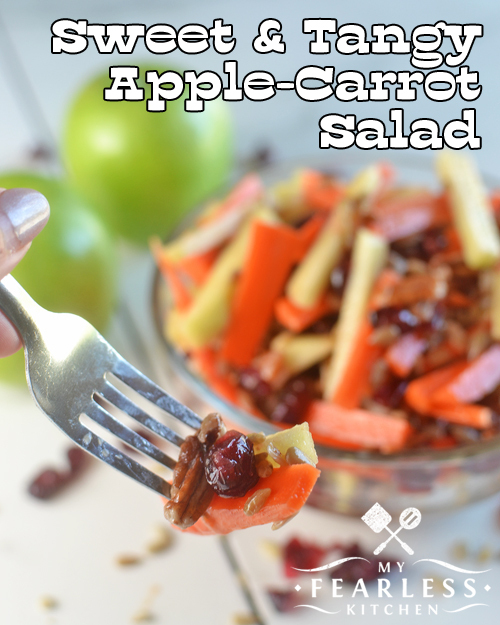 The really nice thing about this salad is that you can find fresh carrots and Granny Smith apples at a reasonable cost all year long – you don’t have to wait for them to be in season! It has such a fresh summer flavor, you’ll think it’s a beautiful summer day no matter when you make it.Plus, if your kids like sweet and tangy flavors, this could be a great way to get them to eat some more veggies. I used the original Ocean Spray Craisins in this recipe. You can try the original flavor, or try one of their other fruit flavors. That would add a fun flavor to the salad! Enjoy this salad with a burger from this list of 7 Easy Burger Recipes, this T-Bone Steak with Compound Butter, or whatever you are having for dinner tonight! In a small bowl, soak the Craisins in ¼ cup orange juice. Set aside while you prepare the rest of the ingredients. Add the sliced carrots, sunflower seeds, and pecans to the apples. Drain the Craisins, reserving the orange juice. Add the Craisins to the apple mixture. Whisk the reserved orange juice with the canola oil, and pour over the salad. Yum! This would make an awesome lunch too! Thanks for sharing on Homestead Blog Hop! I’ve never had apples and carrots together. It sounds like a great combination with the craisins and nuts. Thanks for linking up your recipe on the Celebrate 365 All Things Apple Blog Party!